Methane bubbling to the surface as the Arctic sea ice retreats could have catastrophic consequences for the global economy, a team of researchers argue in a new paper. To avoid the economic pain measured in tens of trillions of dollars over the coming century will "require major reductions in global emissions" of greenhouse gases, the team concludes. The economic fallout will come from an added uptick in extreme weather, rising seas, reduced crop yields and other impacts already associated with global climate change. 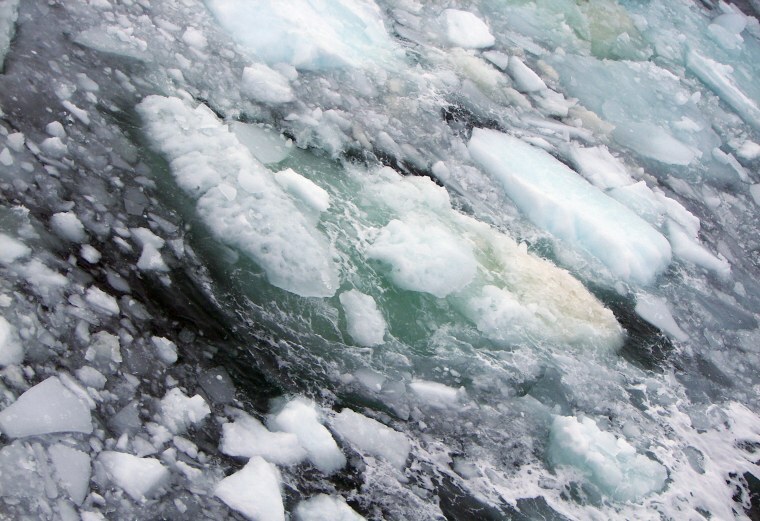 The economic consequences of the Arctic thaw "has not been recognized on the global stage," Gail Whiteman, a professor of sustainability, management and climate change at Erasmus University in Rotterdam, United Kingdom, said during a teleconference with reporters. She and colleagues modeled the costs of projected methane emissions from just one part of the Arctic — the East Siberian Sea, a region where researchers have observed the potent greenhouse gas bubbling to the surface with more vigor over the past several years. "What we got is an incredibly compelling set of data that show the price tag of just this one feedback effect in net present value terms is $60 trillion," Whiteman said. For scale, $60 trillion "is roughly the size of the global world economy in 2012," Chris Hope, a reader in policy modeling at Cambridge University and co-author of the paper, said during the teleconference. The money is in addition to the $470 trillion price tag a 2006 British government study placed on global climate change using an earlier version of this model, the team noted. The basis of the research is the observation the Arctic sea ice has been retreating during the summer at head-turning rates and "may disappear within the next three years," Peter Wadhams, an ocean physicist at Cambridge University and paper co-author, said during the briefing. As the sea ice melts, radiation from the sun heats up the ocean which in turn thaws permafrost lying on the ocean floor. As it thaws, "huge plumes of methane gas" are released into the ocean and some of it escapes to the atmosphere where it accelerates global climate change, he explained. "We are looking at a big effect, possibly catastrophic effect, on global climate that has been a consequence of this extremely fast sea ice retreat," Wadhams said. The paper was published as comment Wednesday in the journal Nature as a bid to start a dialogue about this overlooked piece of the global climate change puzzle, the researchers noted. As a baseline, the researchers assumed 50 gigatons of methane would be released from the thawing permafrost in the East Siberian Sea over the course of the decade between 2015 and 2025, though Hope said the economic impacts are essentially the same if it is released over 10 years or 30 years. The costs of the impacts fall to $37 trillion when the model is run with the assumption that efforts are made to curb other greenhouse gas emissions instead of the "business as usual scenario" where greenhouse gas emissions continue to rise unabated. While perhaps startling, "the numbers in this paper are exaggerated," Richard Tol, a professor of economics at the University of Sussex who was not involved in the new study, told NBC News in an email. "The $37 trillion to $60 trillion seems like a big number ... but it is the cost over the next two centuries," he wrote. "Comparing like with like, what they really find is that there is a small probability of losing 1 percent of income." The 50 gigaton figure comes from estimates of the methane reservoir in the East Siberian Sea in the published scientific literature, noted Hope. And while the economic impacts from the methane are added up over the course of decades as the greenhouse gas resides in the atmosphere, "we are finding that the extra impacts peak around 2050 or 2075 and that's the time period over which we would see most of them." John Roach is a contributing writer for NBC News. To learn more about him, visit his website.